The role of the Game Master (GM) is an important one. Without the GM, the game is nothing more than an attractive picture. The Game Master is the ultimate arbiter of the rules in the game. He or she has the responsibility not only of enforcing the rules, but also of managing the emotions of the players. Speaking from experience, if my 5 y/o son is low on HP, I'll often choose to make a potion appear at just the right time. If you're a parent and you've bought Justinia for your kids, the GM is most likely going to be you. There's nothing stopping older kids from being the GM, but I can tell you from personal experience that an afternoon spent in Justinia is always a satisfying family affair. :) See the 'Game variations' section below for tips on how to simplify the game to make it feasible for younger players to run the game themselves. The GM needs to maintain a balance between making the game too easy and too challenging. The rules (in particular the numbers for each monster, trap, etc.) are designed with this in mind, but the GM can still play an important role here. If you have younger kids and want to encourage them to play by themselves, I suggest (based on experience!) that you allow a simplification of the rules- see below for some suggestions for this. Case in point, you'll notice stars placed around the map. These are suggested locations for the GM to place potions. Each player is represented in the world with a small token that the GM (or the players if you're OK with that.) move around the map. If things get too crowded you can cluster the tokens together; there's no need to be too pedantic about placing the tokens exactly. Here are some suggested amounts for each to start the game. 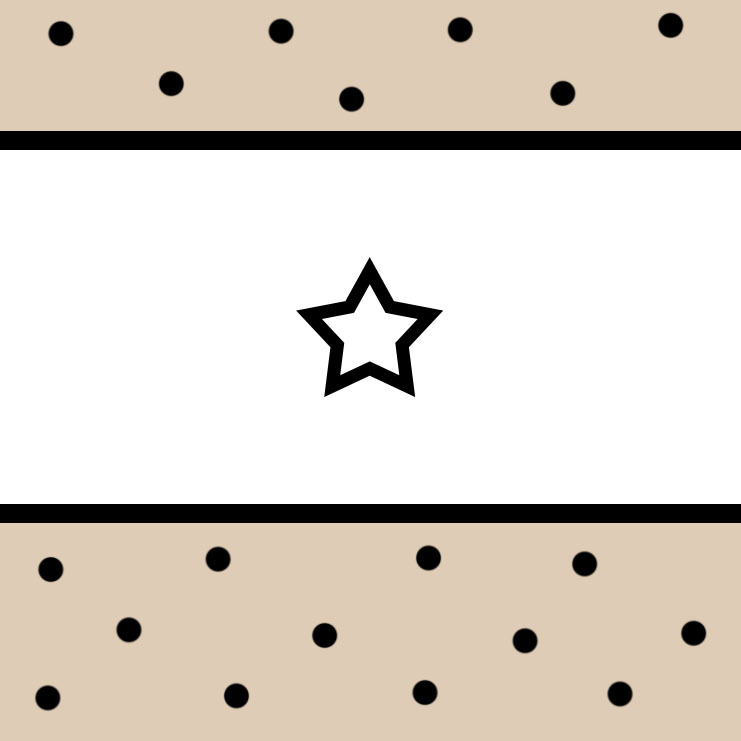 Before they move, the player is in position marked with the two people. They can choose in their first turn to move to either of the positions marked '1'. In the next move, if the player is in the position on the left, they may return to the top of the ladder marked '2'. A player at the other '1' may move up the ladder or encounter the Gold Chest. 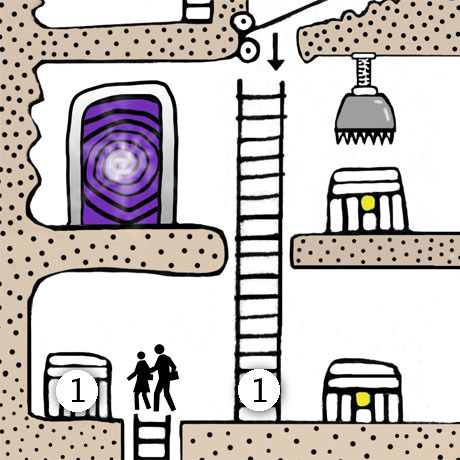 In the next move, the player at the top of the ladder may chose to either go through the portal to the left, or encounter the trap to the right. .. and so it goes for the next move and subsequent moves. Notice too in this example that the arrow pointing down indicates that a player could drop through from above, but not travel against the direction of the arrow. Monsters must be encountered one at a time. In this example, if the player starts in the position marked '1', then they must first encounter a Spider. Look up the Spider in the Monster Rules page and you'll see that it has an attack chance of 2 and a damage of 1. What this means is that the player must roll more than 2 (with 2 dice) to win the encounter. Obviously this is pretty easy, but if they fail, they will take 1 hit point of damage. Next, the player must encounter a Thread Tick. They have an attack chance of 3 and a damage of 2. After this encounter, it's on to the nasty Redback! A good GM will warn players of the dangers of upcoming encounters. (Especially when those players are young 'uns.) In this case an attack chance of 5 and a damage of 7. For each monster, you'll find information on whether or not the player can continue past the monster if they lose the encounter. All of the monsters shown in this example will reappear a few turns later for the player that encountered them and instantly for other players. Larger, unique monsters will not reappear for the player that defeated them, but will reappear for other players. Put another way, (and the GM may chose to waive this rule at their discretion) Guardians of gems, etc. must be defeated per player if those players wish to obtain the gems they protect. Traps may be encountered in a similar way to Monsters. Look up their stats in the appropriate guide, and pay close attention to their possible outcomes. For example, Boots of Speed are lost in Lava and Acid Traps if the player falls in. To encounter a trap, look up its stats in the guide and roll the dice! If the player succeeds then the trap is avoided. If not, then they succum to the trap. In the case of the Lava Trap for example, this means they fall into the trap and must take the damage as well as encounter it again in the next round. It's unreasonable and unrealistic to expect young children to grapple with the full complexity of the rules by themselves. Whilst older children will get a good arithmetic workout from having to add their scores up each turn, this can be too much to expect from younger kids. In this case, I have a few simplification suggestions that you might wish to try. Instead of representing the player's HP and GP with numbers, use small tokens, for instance pieces of LEGO. Addition and subtraction then become simple acts of adding and removing tokens. The tokens can be kept in a pool that they draw from and return to. Monster and trap encounters can be simplified to a pair of single dice rolls- one roll for the monster and if the player rolls one die and gets a higher number then they win. For 'boss' monsters you might like to make it a 2 dice roll for the monster and one for the player. A copy of the map - print it at A3 in colour if you can! One or more people to play. 2-4 is nice. Someone to be the Game Master. This is kind of optional if you all know what you're doing (i.e. the Rules) As I played with my son, it was up to me to run the game, do the arithmetic, teach him arithmetic, etc. Also, you might want to spice things up in the game by having the GM make things appear and happen in the world. For example, potions appearing. For a good GM, there is no conflict of interest. A pair of dice- one pair per player if you're feeling fancy. A small token for each player. We used LEGO 'dots', and moved them around the maps. Something to keep score- paper works fine but you might just want to use your phone / tablet / computer. Something to represent you and your inventory during the game. Mostly for what you're wielding and any potions you've picked up. See the 'Legotars' section of my original post. A 'Fog of War' - in the end I found the best approach was to lay the map down on a magnetic white board and use fridge magnets. Cover the entire map apart from the starting area (It's on the middle left in World One) and reveal the map as the players make their way through it. If this is too hard, just cover up the most exciting parts of the map! Enjoy your quality time with your family and if have any concerns or questions, I'd love to hear from you . Feel free to use this contact form to do that.